The purpose of the tests was to determine the rate of production and dissipation of ozone as produced from the DermaWand. 1. 12" x 12" x 12"
2. 6" x 6" x 6"
3. 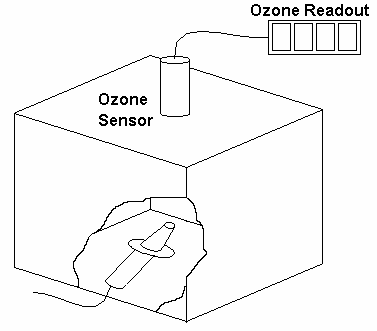 3" x 3" x 3"
The DermaWand was grounded and placed at the bottom of the container, directly below the ozone sensor. The first series of tests were run in the 12" x 12" x 12" container. In this enclosure, after 1 hour there were no readings. Next, the 6" x 6" x 6" container was used. The results in the container are depicted. In the 3" x 3" x 3" container, the readings quickly (within 2 seconds) went to 0.28 ppm and remained there for 30 minutes. The following scales represent the exposure time required to produce the listed toxic effects. The scale is the product of dose in ppm and time of exposure in minutes. 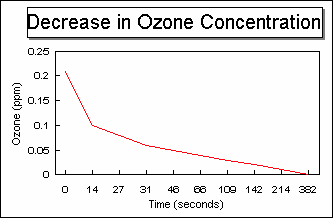 The most severe application of DermaWand is 0.70 ppm-minutes and this would occur if the user were to inhale all of the ozone produced during a 5 minute treatment. 2 Pradyot Patnaik A COMPREHENSIVE GUIDE TO THE HAZARDOUS PROPERTIES OF CHEMICAL SUBSTANCES, Van Nostrand Reinhold. If the DermaWand is operated in an open environment there is no chance that ozone can build up to levels which would be harmful. Further, the quantity of ozone generated by the DermaWand during a most severe application is lower than the lowest levels at which any sign of physical effect can be seen. This compares well with the effects of our application studies where no negative effects associated with the wand were observed.